This guide has been written to help people who have little understanding of the subject of Portable Appliance testing (PAT Testing). This does not pretend to be a comprehensive instruction manual, and further research must be undertaken if you are planning to begin your own testing programme. The testing procedures involve the use of voltages and currents that have the potential to cause harm to the Inspector. It is important to ensure that the equipment under test should not be touched during the testing process. So what is a Portable Appliance? Generally, portable appliances can be thought of as any electrical good that can be plugged into a power socket. This includes such items as FAX machines, hair dryers, drills etc. Portable Appliance Testing incorporates 110 volt and 415 volt (3 phase) appliances, not just mains powered equipment (240 volt). The Electricity at Work Regulations (EAWR) 1989. This applies to all persons – employers and employees – at work, and places a duty of care on all to ensure the safety of themselves and others. In order that the HSWA can be effectively implemented in the workplace, every employer has to carry out a risk assessment to ensure that employees, and those not in his/her employ, are not subjected to danger. Work equipment must be constructed in such a way that it is suitable for the purpose for which it is to be used. Once again, the employer is responsible for these arrangements. Regulation 16 of EAWR 1989 should be mentioned. This Regulation is absolute; this means no matter what the time or cost involved, it must be done. This Regulation deals with the person being competent. The only way to prove to a court of law that you are a competent person is through evidence of regular training. Regular training? Every week or perhaps when new Regulations are brought out? A principle of electrical safety is that there should be 2 levels of protection. Earth + insulation (an earthed appliance) are known as Class 1 appliances. Class 2 appliances are protected using insulation + insulation (a double insulated appliance). Nearly all of the equipment we meet falls into either Class 1 or Class 2. We will concentrate on these here, but seek specialist advice if you feel that you have equipment that falls outside these classes. This is the class of protection we meet most frequently. There are 2 tests that must be carried out, once a careful visual inspection has been conducted, and the equipment has been deemed fit for electrical testing. EARTH BOND TEST – A substantial current is passed down the earth conductor, to the external metalwork and returns via the probe or crocodile clip which is connected to the test equipment. The value of the resistance is shown on the tester. When selecting a test point on the case, bear in mind than many decorative finishes are also poor conductors. We are looking for a low value (<0.1Ω). In the case of a failure, the earth return should present a lower resistance path to earth than that offered by the human body. Where long cables are being tested, the Inspector will need to make an adjustment to the value returned by the test to allow for the resistance in the cable itself, before they can be sure that the nett resistance value is low enough to be considered safe. How this adjustment is calculated is outside the scope of this document. A high test current is used so that should an earth conductor be too flimsy to provide protection under fault conditions, it will fail (melt) under test. This will allow the fault to be remedied before re-testing, and its eventual return to service. INSULATION TEST – A test voltage is applied, usually 500V DC, between the Earth conductor and Live & Neutral linked together. We are looking for a high value (>1MΩ), and results showing infinity (∞) are common. How do you recognise Class 2 equipment? It should be marked with the symbol below. The double box – symbolising the 2 levels of insulation – should be found on the outside of the equipment. There is just one test that must be carried out, once a careful visual inspection has been conducted, and the equipment has been deemed fit for electrical testing. INSULATION TEST – A test voltage is applied, usually 500V DC, between the Live & Neutral conductors linked together and the tip of a test probe. This probe is moved over the exterior of the case, paying particular attention to any openings for cooling etc. We are looking for a high resistance value, and results showing infinity (∞) are common. There are other tests that may be undertaken at this stage. Often the choice of these extra tests is governed by the PAT tester in use. FLASH TEST – This test should only be used where absolutely necessary, and by an Inspector who fully understands all the factors. This test is similar to the Insulation Test (for Class 1 and Class 2) but uses a much higher voltage. It can damage insulation on some equipment, and equipment using sensitive electronics, as in computer controlled devices, can suffer catastrophic failures. OPERATION – By checking that the equipment works, you can be sure that it was switched on when conducting the earlier tests. Monitoring the current draw can be particularly useful to check that lanterns are using lamps of the anticipated rating. This test has the added advantage of preventing a non-working item being returned to service! 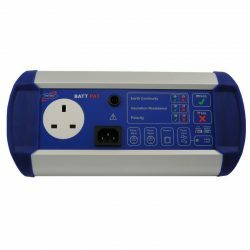 If you are using a PAT Tester that is designed to interface with a PC, the format of record storage and printouts will have been determined for you. You will need to make your own arrangements if you are using a manual tester. Below are samples of the results tables you could use for Class 1 and Class 2 tests. The forms should also include details of the equipment and a means of identifying each item. Identification can be achieved by using the manufacturer’s serial number or a labelling system of your own devising. The Electricity at Work Regulations 1989 require that any electrical equipment that has the potential to cause injury is maintained in a safe condition. Portable Appliance Testing is one way in which to ensure electrical equipment is safe. As stated in the IEE Code of Practice – in order to comply with this the tester must have an understanding of the modes of electrical, mechanical or thermal damage to electrical equipment and appliances and their flexes which may be encountered in a work environment. Training for testers must include the identification of equipment and appliance types to determine the test procedures and frequency of inspection and testing. Persons testing must be familiar with the test instruments used and in particular their limitations and restrictions so as to achieve repeatable results without damaging the equipment or the appliance. You can find this one day on-site training course on the castlegroup website – – and book it online today!